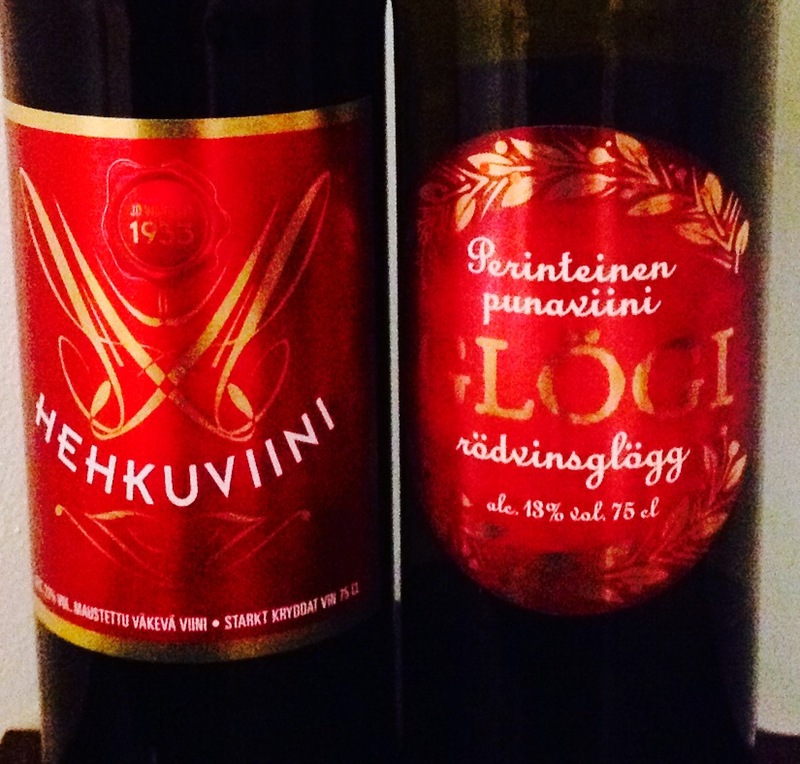 Mulled wines (Glögi or Hehkuviini in Finnish) are really popular in Finland during Christmas time. They can be purchased at Alko’s already at the end of October. As the assortment of mulled wines is quite wide it is important to select right ones. Many of the mulled wines at Alko are too sweet, too strong or strangely flavored. What is odd that first two come from Denmark, which seems to be THE country of mulled wines, if conclusion is based on Alko selection. So, most of the mulled wines are not made in Finland. As a matter in fact, most of them are imported or specially manufactured for Alko and bottled in Finland. Gluhwein comes from Germany, of course. Very popular drink with several producers in Central Europe, but only one brand to be chosen in Finland. 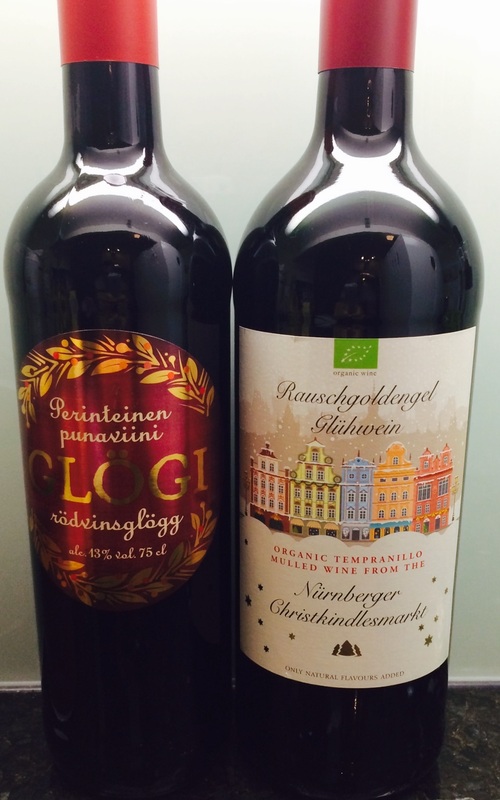 The labels of Danish mulled wine bottles look similar, same red ground and golden decorations. Organic gluhwein label is not so flashy, nice winter picture on it. Hehkuviini is a little bit darker red than Perinteinen Punaviiniglögi. Gluhwine is even more lighter than Punaviiniglögi. However, the difference of the look of mulled wines is usually negligible. The aroma of Perinteinen Punaviiniglögi is softer due to amount of less alcohol. Clove dominates but not disturbingly. Hehkuviini smells like raisin and Christmas spices but alcohol tries to come up. The scent of both wines is christmassy, which is most important savor of mulled wines. Gluhwein bouquet is nice, not too much alcohol which makes sniffing more pleasant. You can find cardamon form Perinteinen Punaviiniglögi. Taste is well balanced and spices are in harmony. In Hehkuviini mostly you can taste almond and gingerbread. As it has more alcohol that can also be noticed. 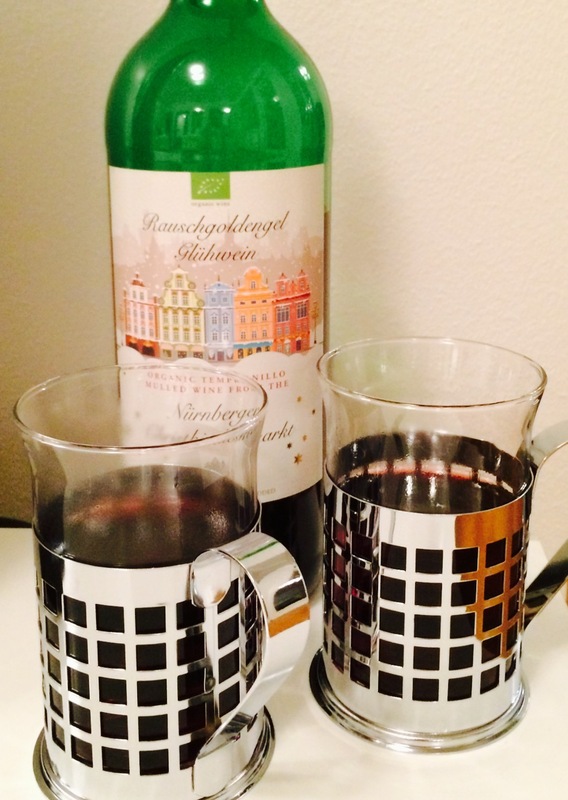 Quite a lot calories too…..
Gluhwein tasted much better than last years version. Balanced spiced taste and tempranillo grapes made this drink winner of the year. And most of all, it is not too sweet. Mulled wines are part of Christmas time, at least in Finland. It is a pity that Alko does not provide wider selection of Gluhweins, only one choice available but fortunately excellent. Gluhweins are quite close to mulled wines, but not so sweet. One option is to buy low-alcohol mulled wines from super markets, but then you also to need to know which ones to pick. Most of them are actually juices.